The client had a high-throughput screening platform (GigaMatrix™, also developed by NOVO) which used extremely high-density, high-aspect-ratio sample plates with up to one million wells (60µm diameter x 6mm deep) in each 3” x 5” plate. To avoid contamination, the plates had to be cleaned according to a set protocol before they could be used in further experiments. 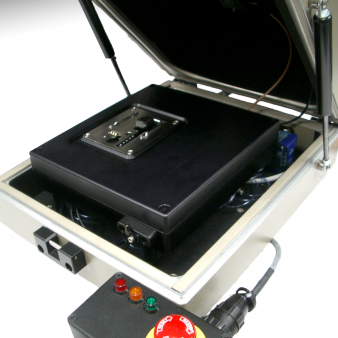 The client envisioned a microplate-cleaning robot with a fully automated process and throughput of 6 plates per hour. Given only the cleaning protocol, the client left NOVO to industrialize and automate the process. Capillary action made cleaning by any low pressure or immersion process impractical. The need for cleanliness, given the stubborn nature of the sample media, and the required throughput suggested multiple pressure and vacuum cleaning and drying stages. The custom labware was expensive and somewhat fragile, so no contact between the upper or lower surfaces of the plate by rigid materials could be tolerated during handling or cleaning. 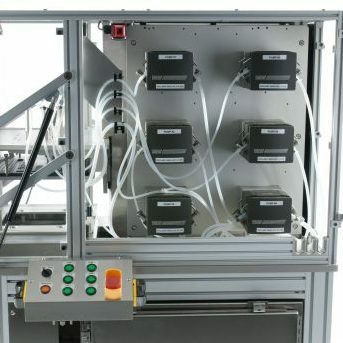 The high-pressure, high-volume dispensing and circulation of process fluids required secure fluidic interconnections; all supply and waste reservoirs, as well as filters, needed to be easily accessed for service and cleaning. Integration of all of the stations and subsequent movement of plates from one station to the next implied further challenges. The client imposed a 16-week turnaround on the project. 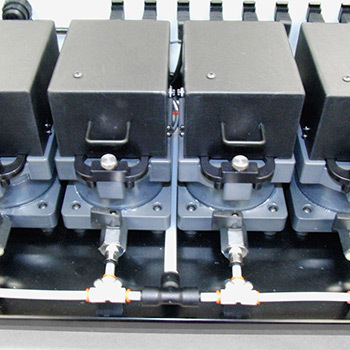 NOVO engineers incorporated a six-axis robotic arm into a custom system with multiple enclosed cleaning stations capable of simultaneous operation. Multiple process steps were required to effectively clean and dry the plates, including pressure washing, ultrasonic cleaning, and vacuum. 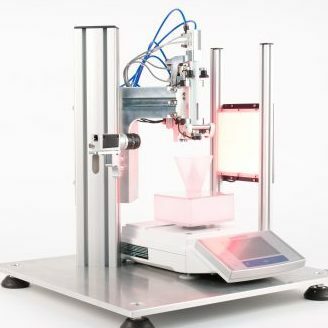 NOVO’s work on this equipment drew upon expertise in multiple areas such as fluid handling, motion control, lab automation, and custom electronics. Electronic controls were a mixture of modular PIC motion controllers and industrial controls. 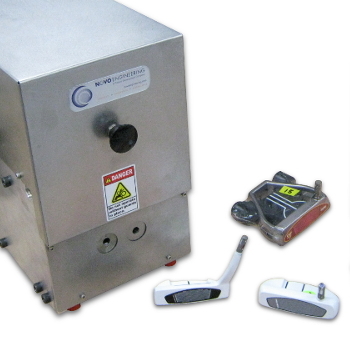 Via biological assays, the client has proven the plate-cleaning robot to be highly effective at complete cleaning of plate wells. Now in daily use, the robot cleans 40 sample plates per day. No operator supervision is required, and maintenance is minimal.